Honey - the Natural Cancer Vaccine? Honey and cancer has a sustainable inverse relationship. Carcinogenesis is a multistep process and has multifactorial causes. Among these are low immune status, chronic infection, chronic inflammation, chronic non healing ulcers, obesity, and so forth. There is now a sizeable evidence that honey is a natural immune booster, natural anti-inflammatory agent, natural antimicrobial agent, natural cancer "vaccine," and natural promoter for healing chronic ulcers and wounds. Though honey has substances of which the most predominant is a mixture of sugars, which itself is thought to be carcinogenic, it is understandable that its beneficial effect as anticancer agent raises skeptics. The positive scientific evidence for anticancer properties of honey is growing. The mechanism on how honey has anticancer effect is an area of great interest. Among the mechanisms suggested are inhibition of cell proliferation, induction of apoptosis, and cell-cycle arrest. In this study, we aimed to investigate whether royal jelly and bee pollen reduce the bone loss due to osteoporosis in oophorectomized rat model. Thirty-two female Sprague-Dawley mature rats at six-month-old, weighing 180-260 g were used in the study. The rats were divided into four groups: Sham-operation group, only oophorectomy group, oophorectomy in combination with royal jelly group, and oophorectomy and bee pollen group. The rats were sacrified within 12 weeks following surgery. Bone mineral density (BMD) was measured and blood samples were collected for biochemical analysis before sacrification. Following sacrification, uterine weights were measured and tissue samples were taken to determine bone calcium and phosphate level with imaging through scanning electron microscope. The uterine weights of the rats were found higher in Sham-operation group than the other groups. The difference among the groups was statistically significant (p=0.001). Total body BMD results were similar in all groups and there was not statistically significant difference (p=0.19). The lumbar spine and proximal femur BMD results were statistically significantly higher in the royal jelly and bee pollen groups, compared to only oophorectomy group (p=0.001). 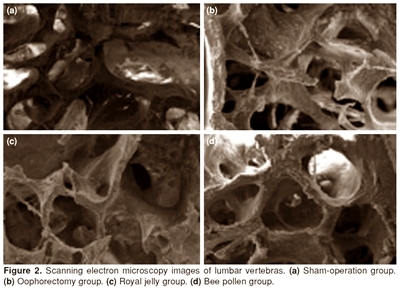 Bone tissue calcium and phosphate levels were higher in royal jelly and bee pollen groups. Royal Jelly also contains a male hormone testosterone. Because of this feature it may also be effective in men’s osteoporosis that could be induced by a decrease of androgen. Considering all these features, RJ and BP may be very beneficial in the treatment of osteoporosis. 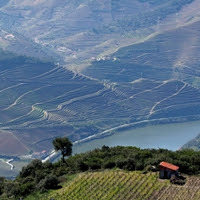 Beekeeping has always been considered a prominent economic activity in the northeastern corner of Portugal, known as the “Trás-os-Montes” region. In November 11th of 1514, the royal charter granted to Bragança by King Manoel, already pointed out some economic privileges of honey bee products "wax, honey (...) above nine coins per batch and for those who buy it for personal use, above one coin, will be tax-free”. At the time, the wax was used mostly for manufacturing candles, which were used in religious ceremonials as a testimony of miracles and graces received. Some dioceses applied a tithe in wax and honey to local beekeepers. The production of reddish honeydew honeys, with high conductivity and low levels of sugar, is another valuable resource of the “Trás-os-Montes” region, where the dense oak forests of the natural parks provide food to the honey bees when flowers are scarce. Quality label honey from “Trás-os-Montes” is one of the strengths of this economic activity and the ideal tool to compete in the global market with products from other regions of the world. The guarantee of this quality requires deep and continuous research in the characteristics and properties together with the innovation in equipment and methodologies suitable to perform the analytical control. Those are the key challenges of the IHC in the search for new knowledge, new approaches and overleap of old and new challenges in the science of bee products. The symposium will be a great opportunity to bring together bee product researchers and to promote the interchange of information, experience and new ideas. A team of researchers from the University of Valencia, the Universitat Politècnica de València, the University Hospital La Fe and the Universitat Autònoma de Barcelona conducted in vitro studies of cytotoxicity (cellular affection) to assess the optimal concentration level of propolis in which this natural substance extracted from bee resin would offer the maximum protection against ionised radiation and not be toxic for blood cells. According to the results of the research, this optimal concentration level is between 120-500 micrograms/mL. "Within this range can be found maximum protection against radiation-induced damage and the substance does not reveal neither a cytotoxicity nor a genotoxicity effect on non-irradiated human lymphocytes", says Alegria Montoro, head of the Laboratory of Biological Dosimetry at the University Hospital La Fe and lecturer of the Master in Radiological Protection in Radioactive and Nuclear Facilities offered by the UPV. The conclusions of this study, which receives funding from the Spanish Nuclear Security Council (CSN), represent a starting point for future clinical applications using propolis. The results were published in the journal Food and Chemical Toxicology; in August a full revision of the study will be presented at the Annual International Conference of the IEEE Engineering in Medicine and Biology Society EMBC12, which will be held in San Diego, California. UAB lecturer Francesc Barquinero, currently on leave to work at the Institut de Radioprotection et de Sûreté Nucléaire (IRSN) headquarters in Fontenay aux Roses, France, participated in the original planning of the study and its design, as well as the interpretation of the results and posterior contextualisation of other studies published. 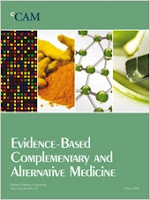 In 2008, researchers at the Institute for Industrial, Radiophysical and Environmental Safety (ISIRyM) of the Universitat Politècnica de València and the University Hospital La Fe demonstrated that propolis can reduce by half the damage inflicted on chromosomes by ionised radiations, thus protecting the DNA from these effects. The new study is fundamental in discovering the range of concentrations in which this substance can have a toxic effect on non-irradiated cells. Royal jelly (RJ) is a secretory protein from the hypopharyngeal glands of nurse honeybee workers, which contains a variety of proteins of which major royal jelly proteins (MRJPs) are some of the most important. It plays important roles both for honeybee and human. Each family of MRJP 1-5 displays a string of modified protein spots in the RJ proteome profile, which may be caused by posttranslational modifications (PTMs) of MRJPs. However, information on the RJ PTMs is still limited. Therefore, the PTM status of RJ was identified by using complementary proteome strategies of two-dimensional gel electrophoresis (2-DE), shotgun analysis in combination with high performance liquid chromatography-chip/electrospray ionization quadrupole time-of-flight/tandem mass spectrometry and bioinformatics. Phosphorylation was characterized in MRJP 1, MRJP 2 and apolipophorin-III-like protein for the first time and a new site was localized in venom protein 2 precursor. Methylation and deamidation were also identified in most of the MRJPs. 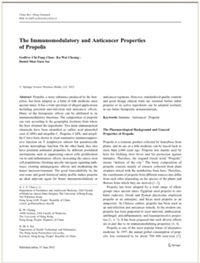 Propolis, a waxy substance produced by the honeybee, has been adopted as a form of folk medicine since ancient times. It has a wide spectrum of alleged applications including potential anti-infection and anticancer effects. Many of the therapeutic effects can be attributed to its immunomodulatory functions. The composition of propolis can vary according to the geographic locations from where the bees obtained the ingredients. Two main immunopotent chemicals have been identified as caffeic acid phenethyl ester (CAPE) and artepillin C. Propolis, CAPE, and artepillin C have been shown to exert summative immunosuppressive function on T lymphocyte subsets but paradoxically activate macrophage function. On the other hand, they also have potential antitumor properties by different postulated mechanisms such as suppressing cancer cells proliferation via its anti-inflammatory effects; decreasing the cancer stem cell populations; blocking specific oncogene signaling pathways; exerting antiangiogenic effects; and modulating the tumor microenvironment. The good bioavailability by the oral route and good historical safety profile makes propolis an ideal adjuvant agent for future immunomodulatory or anticancer regimens. However, standardized quality controls and good design clinical trials are essential before either propolis or its active ingredients can be adopted routinely in our future therapeutic armamentarium.